The golden dorado is, without a doubt, one of South America's most renown native fish. Anglers from all over the world hold close the image of jumping golden dorado from the water like no other, their many jumps rival tarpon, few fish can measure up to. 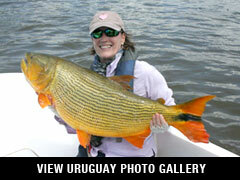 The Uruguay River is a tailwater below the large Salto Grande Reservoir. Fishing can be done year-round except for when they spawn during South America's spring time. Comfortable custom designed skiffs offer wide platforms for unobstructed casting from both the bow and stern. You can fly fish, use spin or baitcast. Anglers may also find large suribin catfish, sardinatas, traira and chafalotes, all of which are excellent fighters. Six to eight anglers can fish at any one time inside the damn (two boats) depending on time of year. $1500.00 May be paid with check, credit card, certified check or money order. Final payments are typically due 60 days prior to departure. Our travel agency can help with your flight arrangements. Note: airfares may change until final booking. Any changes are subject to the airlines rules and baggage restrictions. Since most of your fishing is done on the tailwater, fishing can be year-round. Call us to confirm space availability or to request specific dates. Fly into Montevideo, Uruguay. Transfer via River Plate ground service to Hotel Horacio Quiroga. Hotel Horacio Quiroga very close to the fishery. There are air conditioned double rooms. Included in the package are deliciously cooked meals, beverages, transfers to the fishery, expert guides and specially designed fishing boats. A large variety made to order. Day 1: (Thursday): Arrival in Montevideo (MVD). Transfer via van 5 hours across country side to Hotel Horacio Quiroga. Dinner and overnight at Hotel Horacio Quiroga. Days 2-5: (Friday - Monday): Full fishing days at El Salto Grande Dam. Dinner and overnight at Hotel Horacio Quiroga. Day 6: (Tuesday): Return via van to Montevideo (MVD). Transfer to international airport for flight home. Day rooms and transfers or city tours can be arranged for your time in Montevideo. A valid passport required for U.S. citizens. Passengers assume all responsibility for obtaining valid passports. Sunscreen and insect repellent are recommended. Note: health precautions are offered here as an informational service only. See your doctor or health clinic. Daytime temperatures typically range from 60 to 90 degrees, depending on the season. We recommend you purchase trip cancellation insurance to cover any losses should you have to cancel to due to unforeseen illness or other emergency. Certain restrictions do apply. Premium rates are typically about $65 per $1,000 of coverage, and usually include some benefits for lost baggage, trip interruption, and emergency evacuation. Forms for Travel Insurance may be obtained by calling our office. Information in Trip Details is subject to change without notice. Worldwide Sport Fishing, Inc. is not responsible for any unintentional omissions, or erroneous information which may be provided by the local operator. See our general Terms and Conditions statement. Information contained within this website is copyrighted by Worldwide Sport Fishing, Inc. and unauthorized use of photographs, graphics or text is prohibited by law.